Are you gearing up for your first year of law school??? The last bit of time before the first year starts in nerve-wracking. I spent it trying desperately to prepare myself for the experience: what I would wear, what I would need and what an outline was. It is very hard to prepare and know what to expect from an experience like law school. Also, people were always asking what I needed. I didn't even know what I needed let alone tell them what to get me! So, I have compiled a list of the things I could not have survived my first year of law school without. If you do not have an Amazon Prime account, now may be the time to sign up. As a student, you get it at 50% normal price with all the normal perks: free 2-day shipping, Amazon Prime music, and Amazon Prime video. This is seriously a busy law student's best friend; I use Amazon for pretty much everything except for groceries because it is easy, shipping is quick and the prices are great. Everything I have linked on my list can be purchased off Amazon with free 2-day Prime shipping so sign up for an account now! I promise you will not regret it. Seriously- these are a lifesaver. At school, they block out all the noise and I don't even have to plug them in. At home, they help me to ignore the loud ESPN constantly playing in my living room (thanks, Hubby) while studying or at the gym when earphone cords used to drive me nuts. Also, they are just awesome for whenever I want my music to follow me everywhere without bugging the people around me. I own this cost-effective pair and they are great! You simply have to have a big, hardy book bag to lug all the case books around. I have one with a laptop compartment for added protection. I made sure to get a bookbag that has highly padded straps as my books are heavy and would kill my shoulders otherwise. It may not be very stylish but a bookbag is the only way to go. Law school = longgggg days at the school. Personally, I get super thirsty and I must keep a water bottle with me at all times or I go nuts. I alternate between my Lexis Nexis Camelbak and RTIC tumbler. I fill my bottle in the morning with my own filtered water from home and then it keeps me hydrated all day. I also cannot live without coffee and when I am busy, I just take it on the go. Particularly on mornings, I have class. I love these no spill coffee mugs- I never have to worry about it spilling on my books and it also keeps coffee warm foreverrrrr. You can also use one of these for tea or hot chocolate if you are not a coffee drinker. There is nothing like a warm drink on a cold morning or for a study marathon. Getting from the car to school on a rainy day is the worst. I keep a small umbrella in my bookbag at all times for this very reason. I hate for my books or papers to get wet and also if it is a day where you had to dress up, you will want an umbrella. Better to be prepared! I carry a multitude of pens, highlighters, pencils and various other small office supplies with me at all times in school. Instead of letting them free in my bookbag and make a big mess or get broken, I keep everything together in a pencil case that I can just pull out and set on the desk during class. I like to read before bed but my husband goes to sleep before me. I got this little book light so I can read without bothering him. I get my reading in and it helps me to relax and wind down before bed. I also sometimes use this little light for reading my casebooks in the car when we are driving to our parent's houses on the weekends. It's just something handy to have around. There is so much paper involved in law school. Personally, loose papers drives me crazy so when in doubt, I staple it. I also keep a little stapler in my bookbag for last minute assignments or worksheets from class. Here is a reasonable set of a small and regular stapler! I thought this would be useless but I use it alllll the time! Interviews, trial notes, speakers, moot court tryouts... and so much more I cannot remember. It is just a good thing to have stashed away in your desk for future use. Professional school calls for professional items! I have handed out my resume more times during my first year of law school than any other time in my life. Having a box of resume paper on hand is a great idea to avoid the running to three stores the night before a job fair for paper panic. Resume paper is a bit expensive but it is necessary to complete your professional look. I use legal pads constantly for notes at home, diagrams, outlining papers, practice essays... pretty much any time I need to jot something down real quick. I also love having legal pads come finals time because they are perfect for practicing essays and rewriting outlines/definitions/etc. I am weird though because I only like white legal pads. My desk always seems to be a mess during school, despite my best efforts. Having a desk organizer really helps to keep the mess to a minimum which in turn makes me more productive because a tidy work space is always the best workspace for me. I file all of my outlines, notecards, writing samples and financial information for school in addition to regular bills, records, etc. I file all that school stuff so that I can use them later for bar prep. I have a file cabinet but I know many people do not have room for a full file cabinet in their apartments. A file box does the same job in less space. I could not live without my planner for law school. I write everything down- homework, meetings, to-do lists, grocery lists... it keeps me sane. I personally use a Plum Paper Planner and I am obsessed with it. Here is my whole post about it: The Best Planner for Law School. I could not live without my planner for law school. I write everything down- homework, meetings, to-do lists, grocery lists... it keeps me sane. I personally use a Plum Paper Planner and I am obsessed with it. Here is my whole post: The Best Planner for Law School. Not everyone wants to buy a custom planner so here are some cost effective but still perfectly functional (and pretty!!) options from Amazon. I can be notorious for doing homework from either bed or the couch when I need a break from my desk. Therefore, I love love love my lapdesk. I think everyone should have one, law student or not! When I sit on the bed or floor to study, a little back support is necessary. These boyfriend pillows are the greatest thing. Back and elbow support for when you need to study somewhere other than the desk. I said earlier that law school is full of papers... it can be overwhelming. Along with stapling, I 3-hole punch everything and try to keep in organized in binders. I hate using just the little pad on my laptop so whenever I am at home, I rely heavily on my wireless mouse. It makes research soooo much easier. Invest in at least on quality, well-fitted pant or skirt suit before starting law school. 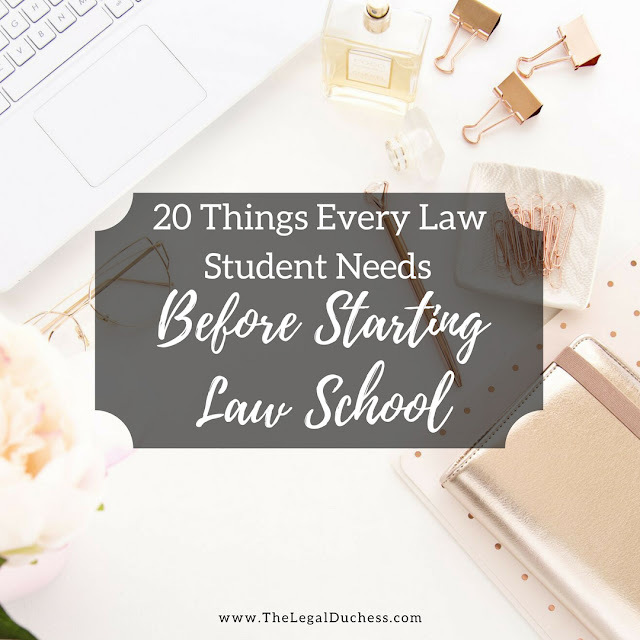 It is just something you need to have hanging in your closet for various interviews, events, and presentations throughout your first year of law school. Law school is not a time in life where you will have tons of money. As a result, most people in my school pack their lunches to save money and stay healthy. Investing in a simple but quality lunch box is a great idea. Enjoy your last weeks before law school!